Did you know that 50% patients of mild sleep apnea (5 to 15 episodes an hour) and 20% with moderate condition (15 to 30 episodes an hour) suffer from positional sleep apnea? This kind of sleep apnea results in breathlessness when patients sleep on their back but gets instant relief as soon as they turn on their sides. Samuel Krachman, D.O. 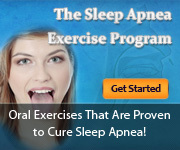 , professor of medicine and director of the Sleep Disorders Center at Temple University School of Medicine and Hospital has recently led a team of researchers for finding a relief device for back sleepers affected by positional sleep apnea. The team has come up with a device called Zzoma, which is in the form of a chest belt with the actual device on the back. The device is firm but made from foam wrapped in canvas to prevent the user from moving on their back. Former Temple Fellow Joseph G. Crocetti who is also the creator of the device and Krachman have worked together and have found that this device is less obtrusive and more convenient to use than traditional CPAP device. Already successful with patients during the past year, the researchers are awaiting FDA approval for the device.